Prestigious houses don't always have to be big and pompous. The best proof of this is the project that we are going to see today by architect professionals Lukasz Lewandowski! They kept this family home small, going for a bungalow style with the materials that they have selected, the timeless colour scheme and the clever design. All of these elements make the size irrelevant. If you're a fan of minimalist style, contemporary design and functional living, you will rejoice in this fantastic building! 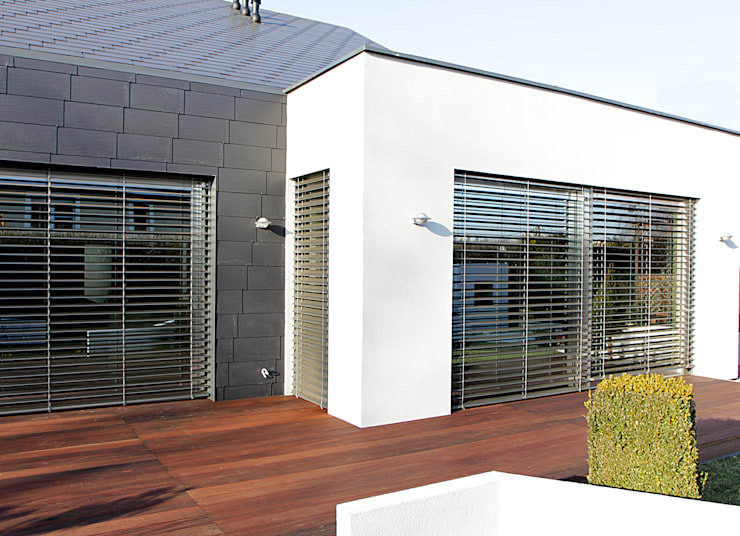 The minimalist facade is very attractive thanks to its dark colours, which are sure to attract everyone's attention. There are some white touches when it comes to the frontal facade. The architectural language of the house is very subtle and features very clean lines. The main body of the house is elongated and features a gable roof, which gives the house a very special appearance. On the street side we can see several vertical windows that are elongated—an unusual design that works very well! Overall this is a combination of traditional elements with new interpretations. The plot of the house is not one of the largest, which means the designers have had to be smart with the space available to them. 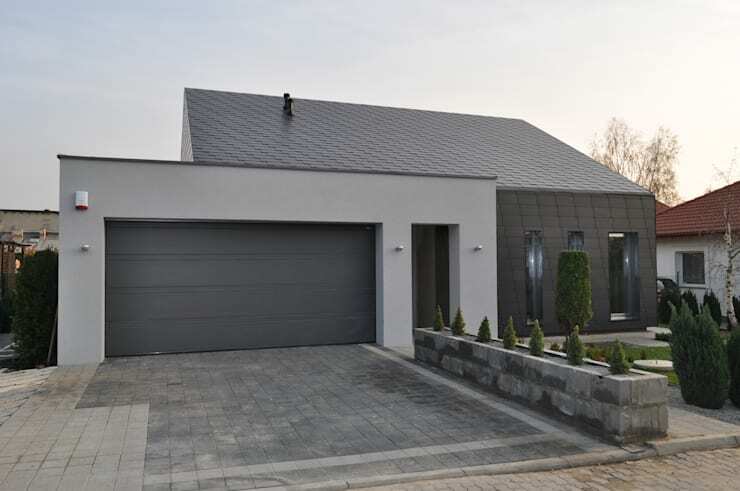 In this image, we can see how they have integrated a garage into the design, which is directly connected to the house. It features a flat roof and a light grey facade, which contrasts with the rest of the home's darker facade. A low wall runs perpendicular to the garage and driveway and features some gorgeous green plants. The rest of the garden also enhances the entire facade thanks to the beautiful plants and flowers that have been carefully picked out. This close-up shows the back of the home, illustrating the contrast between the black slates and the smooth white plaster. This is further enhanced by the magnificent warm brown wooden terrace. The result is a combination of beautiful materials and colour combination that is modern but not too cold. The house is conservative in size but functional, chic and comfortable and therefore perfectly adapted to the needs and desires of the residents. The glazing in this home deserves special attention. The windows are considerably larger on this side of the house than in the front. They allow for sunlight to filter into the interior, as well as there to be constant access to the terrace from almost all of the rooms. 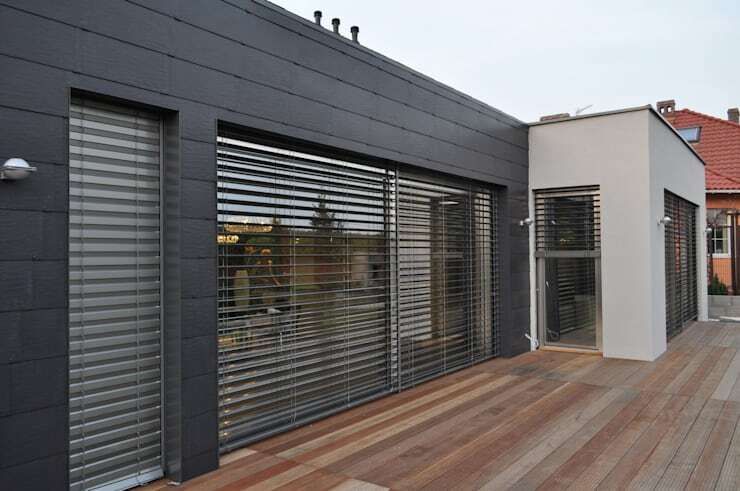 Since the sun come sometimes be a bit too bright, there are shutters on the outside of the windows that allow the residents to control the amount of light that streams into this space. This also allows for a very comfortable temperature indoors as well as comfortable lighting conditions. If you like the idea of glazing, have a look at this: House of amazing glazing. Finally we get to briefly look inside the home. Unfortunately, we only catch a little glimpse of the bedroom but it is enough to convince us of how gorgeous the home truly is. The bedroom features a freestanding bathtub, which adds a little luxurious flair and a touch of extravagance to the space. Don't you love how the large windows offer a beautiful view of the garden? What do you think of this little compact gem?